NOTE: Date must be in the form YYYY-MM-DD, like 2018-09-07. October 27, 1920 - September 06, 2018 - Alline was a retired school teacher with a career spanning from one room school houses and later at Garrett Elementary School, a member of the Mt. Olive Christian Church and Order of Eastern Star. Alline Williams Luttrell, 97, of Dunnville, KY passed away on Thursday September 6, 2018 at her residence. Funeral Services will be held 11amET Monday September 10, 2018 at Mt. Olive Christian Church with Rev. Greg Powell officiating. Visitation will be 6-8pmET Sunday, September 9, 2018 at Bartle Funeral Home Chapel and after 10amET Monday September 10, 2018 at Mt. Olive Christian Church. Burial will be in the Salyers Cemetery. Visitation is Sunday, September 9, 2018 from 6-8pmET at the funeral home. 2018-09-07 - Taylor County, KY - Photo by Calen McKinney, Public Information Officer, Campbellsville Independent Schools. 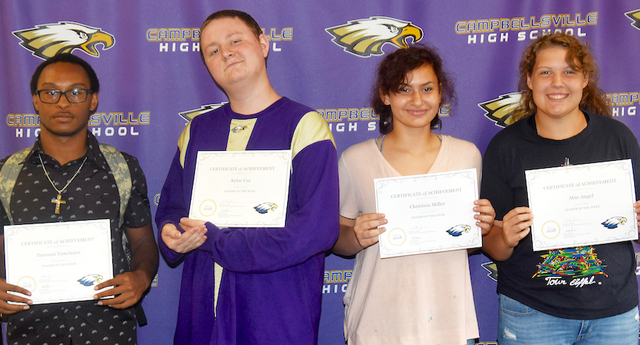 Campbellsville High School recently named its Leaders of the Week for the week of September 3, 2018. Students receive the Leader of the Week award based on their leadership and academic skills inside and outside the classroom. The students are, from left, senior Daesean Vancleave, sophomore Kylar Cox, freshman Christina Miller and junior Abie Angel. The Bicentennial Parade was absolutely awesome and for that reason the Chamber Board of Directors has decided that the 2018 Christmas Parade Theme will be " A Bicentennial Christmas" & invite everyone who had such wonderful entries to bring them back in December! - Gaye Shaw, Executive Director, Edmonton Metcalfe County Chamber of Commerce. She was a retired machine operator for the former Edmonton Manufacturing Company in Metcalfe County, KY. She had made a profession of faith in Christ and was a member of the Oak Grove Separate Baptist Church. She was preceded in death by her husband Curtis Piper on December 29, 1992 having united in marriage on September 6, 1950. Lucy Marion Lile Piper of Greensburg, KY, departed this life on Wednesday, September 5, 2018 at the Green Hill Rehab and Care Center. She was 83 years, one month, and 17 days of age. The funeral services for Mrs. Lucy Marion Lile Piper will be conducted at 11amCT Friday, September 7, 2018 at the Cowherd and Parrott Funeral Home with burial to follow in the Oak Grove Cemetery. Bro. Trent Davis and Bro. Ricky Arnett will be officiating. Visitation is requested from 4-8pmCT Thursday at the funeral home and after 7amCT Friday until time of the funeral service. Pallbearers - Andy Piper, Larry Raynor Howard Bagby, Luke Meadows, Steve Ennis, and Dietz Osborne. Incident occurred during daytime. Male subject said to have forcibly entered home of elderly couple and was shot by husband of the house. Suspect was flown to UL with non-life threatening injuries. ELIZABETHTOWN, KY. (Fri 7 Sep 2018) – Kentucky State Police (KSP) Post 4 detectives are investigating a daytime home invasion that occurred in Elizabethtown, KY.
On September 7, 2018 at approximately 11:52amET; KSP Post 4 was contacted by a resident at 590 Hall Road in Elizabethtown stating her husband had shot a male subject after he entered their residence. She professed faith in Christ and was a member of East Campbellsville Church of God. Caroline loved her church and singing in the choir but above all, she loved her boys and spending time with her family and grandkids. She married Gordon Jones and he preceded her in death. Caroline Jones of Campbellsville, KY died Wednesday, September 5, 2018 in Campbellsville at age 76. Her funeral will be at 10amCT/11amET Monday, September 10, 2018 at Parrott & Ramsey Funeral Home in Campbellsville by Valerie Hunt. Visitation will be from 4-7pmCT/5-8pmET Sunday, September 9, 2018 at the funeral home. Burial will be in Benningfield Cemetery. served his country honorably in the United States Air Force and was a veteran of the Korean Conflict. He retired from Ford Motor Company after working several years in the Quality Control Department. He enjoyed bowling, golfing and most importantly, was a devout Christian who held his Christian values high. Paul Williams of Campbellsville, KY died at 4:15amET Wednesday, September 5, 2018 in Elizabethtown at the age of 87. His funeral service will be at 10amCT/11amET Saturday, September 8, 2018 at Parrott & Ramsey Funeral Home, 418 Lebanon Avenue, Campbellsville, KY by Rev. Gary Durham and Bro. Jamie Bennett. Visitation will be from 8-10amCT/9-11amET Saturday, September 8, 2018 at the funeral home. Burial will be in Green River Memorial Baptist Church Cemetery. She was a homemaker and retired medical office assistant. She attended the South East Christian Church on South West Campus in Louisville, KY. She was a native of Metcalfe County, KY, and a resident of Jefferson County County at the time of her death. She was a member of a highly regarded Metcalfe County, KY, family. She was the daughter of the late Argle & Allie Vance Jeffries and he widow of James Murrell Hurt. She leaves one direct living descendant, her daughter, Shelby Neel of Elizabethtown, KY.
Blanche Jeffries Hurt age 82 of Louisville, KY, passed away peacefully Wednesday, September 5, 2018 at Baptist Health in Louisville. Funeral services will be held 1pmCT, Wednesday, September 12, 2018, at Butler Funeral Home, 201 East Street, Edmonton, KY, with burial in the Metcalfe County Memorial Gardens. Visitation will be 5pm-8pmCT, Tuesday, September 11, 2018, and after 9amCT, Wednesday at the funeral home. The HGR Fall Heritage Family Festival kicks off tomorrow at 8amCT/9amET. Many of the most popular activities from previous years will be returning, and there will be lots of new artists and crafters, exhibitors and food vendors. Homeplace is located at 5807 New Columbia Road, Campbellsville, KY, about halfway between Columbia and Campbellsville. Click 'Read More' for a comprehensive list of this year's Vendors, Activities, and Demonstrations. The HGR Fall Heritage Family Festival kicks off tomorrow at 8amCT/9amET. Many of the most popular activities from previous years will be returning, and there will be lots of new artists and crafters, exhibitors and food vendors. Homeplace is located at 5807 New Columbia Road, Campbellsville, KY, about halfway between Columbia and Campbellsville. The Festival is a family event, and lots to do for the young--and those who wish they were young--including hay rides, a barrel train, and a barn-sized hay maze. Food vendors will be selling pulled pork, tenderloin, catfish, hot dogs, barbeque and rib-eye sandwiches. There will be snow cones, lemonade, Mayfield ice cream and plenty of other things to eat. The only charge will be a $10 per vehicle parking fee and anything spent for food and purchases from the artists and crafters. All other activities are free. The festival will be on-going from 8amCT/9amET until 4pmCT/5pmET. Indictments brought against 4 individuals from Greensburg and Campbellsville, KY, on charges including assault, possession, theft, trafficking, and criminal mischief. TAYLOR COUNTY, KY - (Fri 7 Sep 2018) - On September 6, 2018 at approximately 9:27pmET, Trooper Clint Bale was on routine patrol in the city limits of Campbellsville on South Central Avenue, when he observed the operator of a 1988 Dodge pickup not wearing a seatbelt. As Trooper Bale followed the vehicle the operator made a quick turn on to Carden Street and then Eggers Street without giving a turning signal. KYAfield talks with Deer Program Coordinator Gabe Jenkins about important deer hunting regulation changes for the 2018 - 2019 deer hunting season. RUSSELL COUNTY, KY (Fri 7 Sep 2018) On September 7, 2018, at approximately 1:30pmCT, Trooper Billy Begley was informed by a third party that a female had been assaulted by her boyfriend two days ago. Trooper Begley spoke with Mellissa Loy, who stated she was assaulted by her boyfriend, Ricky Roy, on Wednesday, September 5, 2018.
and lodged in the Russell County Detention Center. She was a Certified Nurse Assistant. She was a native of Cincinnati, Ohio, and a resident of Jamestown, KY, at the time of her death. She was the daughter of Oneda Corner, who survives, and the late John Henry Corner. She was the widow of Everett Wayne Moore. Her final resting place will be in Camp Nelson National Cemetery, Nicholasville, KY.
Brenda Corner Moore, 55, of Jamestown, Ky died Thursday, September 6, 2018 at the home of a brother. Funeral service for Brenda Moore will be 9amCT, Monday, September 10, 2018 at the Bernard Funeral Home Chapel, 367 N Main Street, Russell Springs, KY, with Bro. Andy Robertson officiating. Visitation will be after 8amCT, Monday. Interment in the Camp Nelson National Cemetery, 6614 Danville Road, Nicholasville, KY. There will be a bid opening, Monday, September 10, 2018 in City Hall at 3:00 p.m. prevailing time to receive bids for the Greensburg Street – Sidewalk Reconstruction. "Anyone who consumed food or drink at Druther's Restaurant in Campbellsville, KY from August 14 through August 26, 2018 may consider Hepatitis A vaccination. Druther's Restaurant is fully cooperating with the Health Department and is working with the Health Department to get all employees vaccinated. There is minimal risk..."
A case of Hepatitis A has been diagnosed in an employee who handled food at Druther's Restaurant located at 101 North Columbia Ave. Campbellsville, KY. Opening ceremonies for the Edmonton Bicentennial will be held at City Hall, East Street on the Square in Edmonton starting at 11:30amCT and concluding at approximately 12:30pmCT to kick off the three day celebration. FRANKFORT, KY (Thu 6 Sep 2018) – Gov. Matt Bevin has directed that flags at all state office buildings be lowered to half-staff on Friday, September 7, 2018, in honor of Chief Warrant Officer 3 Taylor J. Galvin, 34, a Fort Campbell soldier who died while supporting Operation Inherent Resolve. --Robert Stone, Friday, 7 September 2018. - Holly Kerns, Sano, KY. I have Green Beans, Squash, Hot Pepper, and a few Tomatoes -Holly Kerns, at 5:48amCT. Green County Judicial Center, 200 W. Court Street, Greensburg, KY. Two (2) Court Event(s) Circuit Court. No (0) Court Event(s) District Court. Taylor County, Justice Center, 300 E. Main Street, Campbellsville, KY. Three (3) Event(s) in Circuit Court. One (1) Court Event(s) District Court.